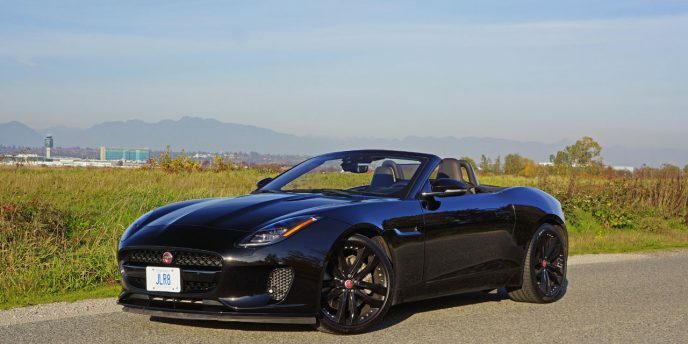 Jaguar installed its potent yet economical gasoline-powered Ingenium turbocharged and direct-injected 2.0-litre four-cylinder engine into its gorgeous 2018 F-Type sports car last year, with an after effect being a significantly reduced base price of $68,500. That was a $10k advantage over the previous base price, and this car, in model year 2019 open-top form, is in our garage this week. Pricing for the car in question starts at $72,500 this year, while the Coupe’s price has been raised to $69,500. With such an attainable point of entry the new F-Type P300 Coupe and Convertible models become prime 718 Cayman and Boxster competitors, while pricier more powerful F-Type trims continue to fight it out with the Porsche 911 and others in the premium sports car segment. The turbocharged four-cylinder should provide more than enough performance for plenty of sports car enthusiasts thanks to a very healthy 296 horsepower and 295 lb-ft of torque combined with the F-Type’s nimble and lightweight aluminum chassis and body structure, especially when considering that key competitors Audi, Mercedes-Benz, BMW, and Alfa Romeo don’t offer anywhere near as much output from their entry-level four-cylinder sports models, with 220 horsepower for the TT, 241 for the SLC, 241 for the Z4, and 237 for the 4C, while F-Type P300 numbers line up right alongside Porsche’s dynamic duo that are good for 300 horsepower and 280 lb-ft of torque apiece. Jaguar makes its eight-speed Quickshift automatic transmission standard in this rear-wheel driven model, a steering wheel paddle assisted gearbox that delivers ultra-fast shift intervals that result in a particularly spirited 5.7-second sprint to 100km/h before attaining a limited top speed of 250 km/h (155 mph). But how does it feel from the seat of the pants? Make sure you check out my full review of the F-Type P300 Convertible shown here in the photos, where I’ll divulge just how well all of this turbocharged four-cylinder goodness comes together. And don’t think for a minute that it’s not going to be positive. Silence is golden, and in the case of the inherently quiet Jaguar I-Pace it’s also very fast thanks to plenty of all-electric power. The legendary British luxury brand’s new electric-powered crossover SUV just set a record for “showroom stock” production electric vehicles lapping Monterey, California’s renowned Laguna Seca racecourse, just before going on display at the 2018 Rolex Monterey Motorsports Reunion and the Pebble Beach Concours d’Elegance. The entertaining two-minute clip shows just how potent the new I-Pace is, and just how much fun. Pobst even chuckles while the I-Pace drops downward into the famed corkscrew (turn 8), an experience that often leaves the uninitiated breathless and hanging on for dear life as the car plunges from an elevation of 283 metres (929 feet) to 265 m (870 ft) within seconds (it’s the equivalent of a 5½ storey drop in just 137 m / 450 ft of track distance), the rollercoaster ride continuing on its steep decline past turn 9 (250 m / 820 ft), turn 10 (236.5 m / 776 ft), and turn 11 (233.5 m / 766.3 ft) before exiting onto the finish straight. 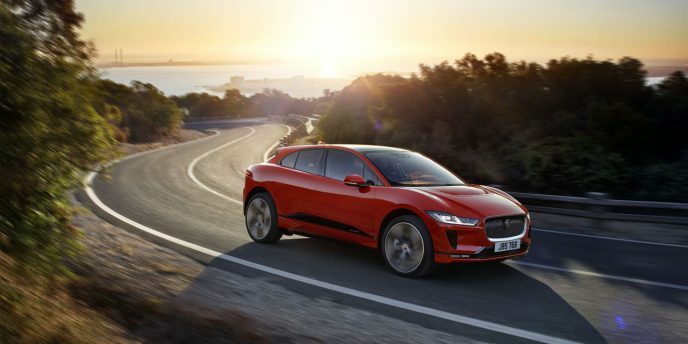 The new 2019 I-Pace uses a 90-kWh pouch-cell lithium-ion battery pack plus a permanent magnet electric motor at each axle for standard all-wheel drive, the combination good for 394 horsepower and 512 pound-feet of torque, which means it can sprint from standstill to 100 km/h in just 4.8 seconds before maxing out at a top speed of 200 km/h (124 mph). On a more practical note, the new 2019 I-Pace has an EV range of 386 km (240 miles), which should provide most users with multiple days between charges, plus the ability to travel short distances or extend road trips longer when recharging stations can be found along the way. Few who have driven the new Jaguar XE have come away complaining. It’s arguably attractive, mostly well finished inside, filled with an impressive load of features including some nicely kitted out electronic interfaces, and plenty roomy, plus its lineup of powertrains, ranging from a 247 horsepower turbo-four to a 380 horsepower supercharged V6, make the most of its lightweight aluminum body shell and agile independent suspension. Just the same, a hyper-powerful SVR variant would be nice. SVR, which is a sportier marketing variation of the short-form for Special Vehicle Operations (normally called SVO albeit shown on JLR products as an SV with an O wrapped around the outside and an R following), is the Jaguar Land Rover answer for BMW’s M performance sub-brand, Mercedes’ AMG, Audi’s RS, Alfa Romeo’s Quadrifoglio, Volvo’s Polestar, Lexus’ F, Cadillac’s V, and so on. A number of Jaguar and Land Rover products already boast the three-initial moniker, but the most recent is the Jaguar F-Pace SVR, a vehicle directly related to the XE. Unfortunately, Jaguar’s compact luxury D-segment sport sedan has yet to be given the usual 550- to 575-horsepower supercharged V8 SVR treatment in order to compete with the likes of the M3, C63 AMG, Giulia Quadrifoglio, ATS-V, etcetera, but this is about to change as enthusiasts plugged into the Euro performance car pulse will already know. 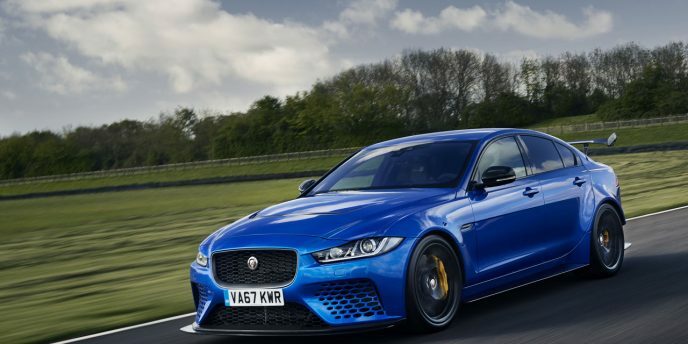 For those not in the know, meet the new Jaguar XE SV Project 8. After a reasonably long gestation, which first saw the Warwickshire, England SVO outfit’s skunkworks project semi-debut in camouflage photos in May of last year; then receive an official web intro in June; arrive in the metal at the Goodwood Festival of Speed in July (where it won a “Showstopper” award); make its North American debut in August at the Monterey Car Week; record the fastest time ever of 7 minutes and 21.23 seconds on the Nürburgring Nordschleife for a sedan of production-intent specification in November (which bested the aforementioned Alfa Romeo Quadrifoglio’s time of 7 minutes 32 seconds, although despite the Alfa being a full production car, Jaguar plans to improve on the pre-production XE SV Project 8’s capability when the final street-ready version arrives), not to mention the fastest lap ever for a Jaguar; and debut near final production refinements in April of this year, which was quickly followed up later in April with some track time by legendary sports car racers Andy Wallace and Davy Jones on the Goodwood Motor Circuit; the finished Jaguar XE SV Project 8 is almost upon us. “Most road-legal cars on track are a massive disappointment, but Project 8 is really something,” said Andy Wallace. “It’s absolutely staggering how it has been made to feel like a proper racing car. It keeps wanting you to push harder. It’s not bothered by Goodwood’s undulations, it just hunkers down and feels totally at ease, so you’re happy to get on the throttle earlier. It inspires confidence straight away. “I’m used to powerful racing cars,” added Davy Jones. “But this feels really fast. The sheer acceleration didn’t feel all that different from a 700bhp racing prototype – and that really surprised me. It’s certainly Jaguar’s best track car I’ve driven since the sports prototype Jaguars of the 1980s and 1990s. It’s fair to expect the ultra-exclusive group of 300 XE SV Project 8 owners should be well pleased with their upcoming purchase, the custom-built hyper-sedan, hand-assembled at the SVO Technical Centre in Warwickshire, costing a cool $188,495 USD, the equivalent of $247,940 CAD at the time of writing. When it arrives the XE SV Project 8 will have the highest output of any street-legal Jaguar vehicle in the British brand’s long and illustrious history, its 5.0-litre supercharged V8 making a shocking 592 horsepower and 516 lb-ft of torque, while a sport-tuned eight-speed ZF automatic transmission promises the quickest possible shift intervals along with the ability to drop multiple ratios at once via non-sequential downshifts, which will quicken pre-corner setup to enhance circuitous road and track performance. The eight-speed auto puts power down to all wheels, with a maximum of 30 percent motive power going to the front axle in order to produce rear wheel bias for maximum performance and feel. The all-wheel drive system will be torque vectoring, of course, while the electronic rear differential keeps temperatures low via an exclusive cooler situated within the rear diffuser. The XE SV Project 8 provides three driving modes, including Normal, Dynamic and Track, Eco not on the menu for obvious reasons, while this is the first time we’ve seen Track mode on an XE. SVO says that the drive modes adjust the throttle, torque vectoring control, dampers, steering, all-wheel drive system, and the stability control, which is about as comprehensive as such systems get. The regular XE already has an extremely agile, lightweight, aluminum-intensive double wishbone front and integral link rear suspension setup, but the SVO team has modified almost everything anyway. An in-house developed billet suspension knuckle includes ceramic bearings to reduce unsprung weight by 840 grams, while also improving steering response by minimizing friction and increasing rigidity. Speaking of stiffness, Warwickshire has uprated the suspension bushings, with those in the rear upper control arm replaced with ball joints, while both front and rear anti-roll bars have been modified to improve high-speed stability. The electrically assisted power steering and the continuously variable damper systems in the stock XE are both carried forward into the new Project 8, although they’ve been reprogrammed for quicker, more responsive reaction, while an available Track Pack provides manually adjustable spring platforms that let you lower the ride height by 15 mm to optimize handling. Nothing resembling the Project 8’s Brembo carbon ceramic discs can be found in any current XE, as the massive 400-mm front rotors are clamped down on with six-piston calipers and the 396 mm discs in back get grip from a large single piston caliper. Brembo claims that its new-tech brakes achieve temperature reductions of 38 to 93 degrees Celsius, which should all but eliminate fade even when on the track, important for a car that weighs in at 1,745 kg. The larger V8 powertrain is responsible for most of the XE SV Project 8’s 24 kilos of extra weight over the otherwise sportiest supercharged V6-powered XE S (the aforementioned Track Pack reduces weight by 12.2 kg), but the aero bodywork, especially the massive wing on the rear deck lid, has got to account for something. It’s certainly necessary to keep the car planted at its 322-km/h (200-mph) top speed, whereas any weight gain hasn’t hampered its zero to 100km/h sprint time, which is claimed to take just 3.7 seconds (3.3 seconds to 60 mph). The rear door skins, unmentioned by Stanton, are formed from aluminum and much wider as they flare into the rear fenders, which are bulge outward by 55 mm to accommodate 305-width rear tires. Most of the other modified bodywork and aerodynamic aids are made from lightweight carbon-fibre, and the list of changes is far too long to itemize. All the modifications result in a major difference to XE SV Project 8 styling, but those owners who still want to use their car as a regular driver will be happy to learn the interior hasn’t deviated much from the already spacious and comfortable stock XE. Rather than a third seat in the rear centre position, the SVO team has followed the usual rule for super sedans by providing two rear bucket-style seats. The previously noted Track Pack, on the other hand, loses its rear seats altogether for a track-ready roll cage. The “Project 8” embroidered sport seats up front are much more aggressively bolstered than those in the rear of the base car, although they’re still covered in leather with suede-like Alcantara insets. Rich Alcantara wraps the instrument hood, dash top, steering wheel rim and door inserts as well, while bespoke carbon-fibre lower console surfacing surrounds a conventional pistol grip gear lever in place of the regular XE’s rotating dial. The new gasoline-powered, turbocharged and direct-injected Ingenium 2.0-litre four-cylinder engine was first introduced to the 2018 Jaguar F-Type sports car last year, providing a new more affordable entry-level trim for attracting more sports car fans to the beautiful two-place coupe and convertible. Since then, both the F-Pace and the XE compact sport-luxury sedan have been given the same value-added treatment, which Jaguar hopes will make them more appealing in their respective market segments. 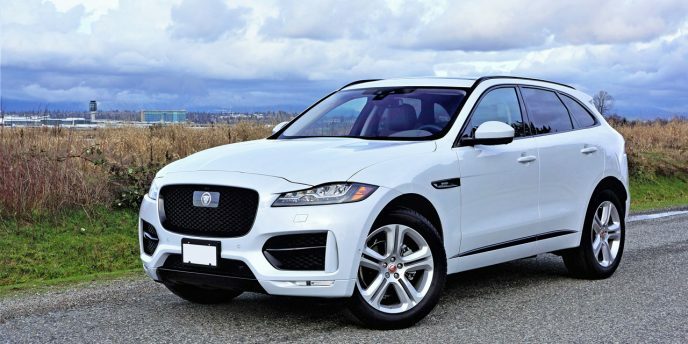 Specifically to the SUV being reviewed here, the already popular F-Pace receives a $650 price drop from $50,900 last year to $50,250 this year, while the 20d turbo-diesel, last year’s base engine, gets a minor $350 price increase to $51,250. Along with the reduced pricing comes dramatically improved performance in base trim, the 20d being highly efficient yet not as quick as the new gasoline-powered turbo-four. By the numbers, the new F-Pace 25t AWD model’s zero to 100km/h sprint time drops to just 6.8 seconds from 8.7, while its top speed increases from 208 to 217 km/h. As noted the tradeoff is fuel-efficiency, with the F-Pace 25t AWD estimated to achieve a Transport Canada five-cycle fuel economy rating of 10.7 L/100km in the city, 8.8 on the highway and 9.9 combined, and the F-Pace 20d AWD good for a claimed 8.9 city, 7.2 highway and 8.1 combined, a considerable savings even before factoring in the price of diesel fuel, which is less expensive in most jurisdictions. Your choice will come down to priorities. The performance option is now standard, while a mere $1,000 bump upwards for the turbo-diesel makes it a viable option for those wanting to eke as much distance as possible out of a tank of fuel. The new 2.0-litre turbo-four comes standard with aforementioned base Premium trim, as well as mid-range Prestige trim that starts at $54,750, and my test model’s performance-oriented R-Sport trim that can be had for $60,000. Earlier in this review I mentioned the F-Pace 30t, which is an even more potent version of the 2.0-litre Ingenium turbo-four. It starts at $52,750 and can be had in all of the above trims, while it also becomes the new base engine for the more feature-filled $67,200 Portfolio model, this engine putting out 296 horsepower and 295 lb-ft of torque for a 6.0-second sprint from zero to 100km/h and a top speed of 233 km/h. Despite the much-improved performance, fuel economy is only minimally affected at just 10.9 L/100km city, 8.7 city and 9.9 combined. Lastly, the F-Pace can also be had with a 3.0-litre supercharged V6 that’s good for 380 horsepower and 332 lb-ft of torque, making the so-named F-Pace S AWD a full half-second faster from zero to 100km/h than the F-Pace 30t AWD, with a quickest time of 5.5 seconds and higher terminal velocity of 250 km/h. My tester’s 255/50R20 Michelin Latitude Tour HPs on twinned five-spoke alloys were a step up from the base 19s, the wheel and tire upgrade part of R-Sport trim that also adds uprated 350-mm front brake rotors for improved stopping power if you opt for the more formidable 30t engine, while less potent models like my loaner rely on 325-mm front discs that still provided strong, linear braking capability with minimal fade after repeated stomps on the pedal. Along with the LED headlamps the R-Sport gains visual impact via an exclusive body styling and exterior trim kit comprised of a sportier front bumper design, satin-chrome front fender “power vents” with R-Sport badges, body-colour R-Sport door claddings with grained matte black finishers, and more, which makes the addition of standard blindspot monitoring with reverse traffic detection all the more important—we wouldn’t want to scratch all that sporty bodywork now, would we? The front and rear parking sensors pulled up from Prestige trim help in this respect too, that mid-range model also providing the R-Sport with headlight power washers, a powered steering column with memory, cool soft glowing mood lighting, a very accurate and easy to program navigation system, and more. Additionally, you’ll be stepping over R-Sport branded metal treadplates to get inside, where you’ll also find exclusive bright sport pedals, a satin chrome console storage surround to go along with the satin chrome touchscreen surround that also gets pulled up from Prestige trim, perforated grained leather upholstery, and more. Lastly, some highlights from base Premium trim that remain part of this R-Sport model include proximity access and ignition, an electromechanical parking brake, a garage door opener, rain-sensing wipers, touch-sensitive JaguarSense switchgear for the LED overhead lights, an auto-dimming rearview mirror, auto-dimming and power-folding heatable side mirrors with approach lights and memory, driver’s seat memory, dual-zone auto climate control, a large 8.0-inch infotainment touchscreen with attractive graphics and an easy-to-use layout, an excellent backup camera with dynamic guidelines, great sounding 11-speaker 380-watt Meridian audio, satellite radio, Bluetooth audio streaming, a massive panoramic sunroof, a powered liftgate, a reversible load floor that switches from luxury carpeting to a more washable rubberized surface, more convenient 40/20/40 split-folding rear seatbacks that allow longer items like skis down the middle while rear occupants enjoy the more comfortable window seats, a commodious 648-litre (22.9 cubic-foot) cargo compartment (948 litres or 33.5 cubic feet by U.S. EPA standards) that expands to a generous 1,798 litres (63.5 cubic feet), etcetera. Incidentally, the fully configurable 12.3-inch HD TFT Virtual Instrument Display you may have already seen in a photo as part of this review isn’t standard with the F-Pace or this R-Sport trim, but rather it’s an upgrade (from a regular analogue gauge cluster with a 5.0-inch colour multi-info display) that comes as part of the $3,320 Technology Pack, which also includes an enhanced InControl Touch Pro Navigation system on a larger 10.2-inch widescreen display; InControl Pro Services featuring a door-to-door route planner companion app, the ability to share your ETA, a Commute Mode that learns your regular route and automatically advises of traffic problems and possible detours, plus an Arrival Mode that displays an interactive 360-degree street view of your destination; and a sensational Meridian surround sound system with Trifield Technology, 825 watts of power through 16 amplifier channels, 17 speakers including a sub, Advanced DSP, Audyssey MultEQ equalization, and dynamic volume control. Jaguar also added a $440 heated front windshield, a factory-installed $720 tow hitch receiver, and finished the outer panels in no-cost Fuji White paint (one of 12 colour choices), while its complete lack of exterior chrome trim meant that a $510 Black Pack R-Sport trim package replaced the metal brightwork surrounding the grille, side power vents and side window surrounds with Gloss Black, while the mesh grille itself was also glossy black, as were the otherwise body-colour door cladding finishers. My tester also featured no-cost Oyster medium grey leather with cool looking light green contrast stitching (Ebony with white stitching, two-tone Ebony/Pimento with red stitching, and two-tone Ebony/Light Oyster with light grey stitching are no-cost options too), this found across the dash, down the sides of the centre stack/console, on the door panels, the armrests and the seat upholstery, while the R-Sport model’s standard piano black lacquered instrument and door panel inlays were replaced with $260 Etched Aluminum ($410 worth of Satin Burr Ash hardwood is also available). While the F-Pace 25t AWD R-Sport that Jaguar loaned to me for my weeklong test was nicely outfitted, there were many more features that could have been added to this specific trim, such as an $1,130 Adaptive Dynamics Pack featuring configurable electronically controlled dampers and Adaptive Surface Response (ASR); a $2,040 Comfort and Convenience Pack with cooled front seats, heatable rear outboard seats, power-reclining rear seatbacks, rear seat remote release levers, and a gesture liftgate; a $2,350 Luxury Interior Pack with illuminated treadplates, a Suedecloth headliner, four-zone climate control, an air quality sensor, a cooled glove box, configurable mood lighting, premium carpet mats, and two 12-volt power sockets in the second row; a $3,320 Driver Assist Pack including a surround parking camera, a 360-degree Parking Aid, semi-autonomous Park Assist self-parking, traffic sign recognition, an Adaptive Speed Limiter, and Adaptive Cruise Control with Queue Assist and Intelligent Emergency Braking. Finally, standalone features not yet mentioned include $160 cargo storage rails, $360 InControl WiFi, a $410 waterproof Activity Key that wears like a bracelet while swimming or doing other outdoor activities, a $490 full size spare tire on a matching alloy wheel, a $1,020 head-up display, and myriad wheel and tire options. Speaking of market growth, before the F-Pace arrived Jaguar had zero SUV sales, but after just seven months on the market it had found 1,289 buyers, while after a full 12 months of sales ending on December 31, 2017 the F-Pace managed 2,612 deliveries, placing it eighth out of 14 competitors. What’s more, the F-Pace clearly leads all other Jaguar models in sales, proving once again how important sport utilities are to a brand’s bottom line. While the F-Pace is up against some serious competitors, the market segment led by Audi’s all-new Q5, Acura’s completely redesigned RDX, Mercedes’ still fresh GLC, Lexus’ edgy NX, and BMW’s fully reworked X3, just to name a handful, it’s easily one of the sportiest of its ilk, arguably one of the best looking, and no doubt one of the most practical due to its larger than average size. Its newfound increase in base performance and slight decrease in price should only help it gain more traction in its segment, which bodes well for a positive future. Now the question remains whether you’ll be part of its success story. Jaguar fans that liked the I-Pace Concept and kept fingers crossed that the production version wouldn’t stray too far from its inspirational design can breathe a collective sigh of relief now that the real deal has been revealed, because it’s nearly identical to the prototype launched in Geneva a year ago. Jaguar introduced the 2019 I-Pace EV to the world on Thursday, March 1 in Graz, Austria, at Magna Steyr’s production facility where it will be built alongside the new E-Pace subcompact luxury SUV. The introduction, which was hosted by British comedian Jack Whitehall (Fresh Meat, Bad Education, panellist on the game show A League of Their Own, host of the 2018 Brit Awards) in a similar format to the BBC’s Top Gear, took place in front of a live audience and simultaneously online, a video of which we’ve included in its entirety at the end of this story (plus loads of event photos within the gallery). 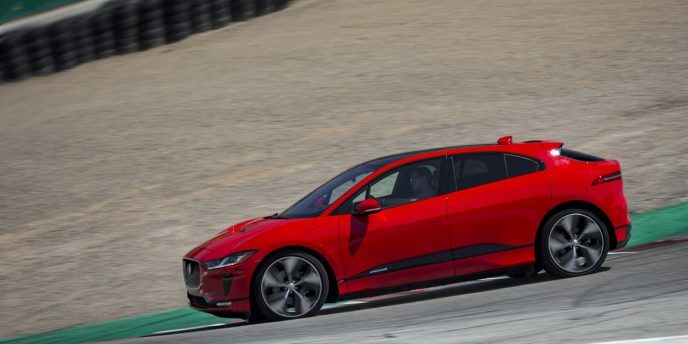 Still scheduled to go on sale during the second half of this year as reported here before, the new I-Pace is admittedly attractive, benefiting from trademark design cues currently in use by the just noted E-Pace, its larger F-Pace SUV sibling, as well as every other Jaguar within the iconic luxury brand’s lineup, including the beautiful F-Type sports car. Production details that differ from the I-Pace Concept include slightly reworked front and rear fascias, larger side mirrors, remoulded side window surrounds, a slightly smaller maximum wheel size of 22 inches (the concept wore 23-inch rims), and other changes both outside and within. At least as importantly, of all the EVs that have come before, the I-Pace will be one of only two fully electric crossovers available when it hits the market, and the sole compact luxury SUV to be sold without an internal combustion engine (ICE). It’s in good company with respect to the former statistic, its slightly larger competitor being Tesla’s Model X that sold 1,800 units in Canada last year (if their perfectly regular 150 per month totals are to be believed). In case you were wondering, SUV-based electric vehicles are rare amongst mainstream volume brands too, with Kia’s near four-year old Soul EV finally being joined by sister brand Hyundai’s all-new Kona Electric, but that’s it. Considering the success of crossover SUVs in today’s market and newfound challenge of selling traditional cars, the new I-Pace will have a clear advantage over competitive car-based EVs, such as BMW’s i3 and Mercedes-Benz’ B-Class Electric Drive (the latter not available in Canada). Still, it will soon be forced to face off against SUV EV rivals from Audi and Mercedes that are on the way, so it had better make haste while it can. Make haste it should. We reported on the I-Pace drivetrain in a previous story, but Jaguar provided some more exact details with its March 1 announcement. For starters, range increases from the previous maximum estimate of 355 km (220 miles) to 386 km (240 miles), which will allow most users multiple days without the need to charge, as well as the ability to head out of town on short trips. The new number is also strategic, as it stretches 5 km (3 miles) farther down the road than the base Tesla Model X 75D. Providing you’re easy on the throttle, maximize use of the regenerative braking system when coasting downhill, and spend as little time as possible at highway speeds (we recommend leaving during rush hour), such range would allow someone living in Toronto to drive all the way to Blue Mountain and back again with enough battery storage left over for a few side jaunts, while a wine tasting tour to Niagara on the Lake and back shouldn’t require any extra charging at all. A trip to Muskoka, on the other hand, will require a top up in Barrie or somewhere else along the way. If you’re reading this from the West Coast, Vancouver to Whistler takes less time to travel than Toronto to Blue Mountain (and traffic is often so backed up you’ll have no problem keeping speeds down), so it should be no problem to go there, tour around a bit, and then come back in the I-Pace, while wine tasting in Kelowna is almost reachable from a single charge, theoretically at least (you’ll probably need to top up in Merritt or at best West Kelowna). The I-Pace uses a 90-kWh liquid-cooled battery that’s housed in an aluminum casing within the floor’s structure, and requires just 40 minutes to fill from a fully drained state to 80-percent capacity when hooked up to a 100-kW DC quick charger. On a regular 240-volt Level 2 home charger you’ll need about 10 hours to achieve the same results, or slightly less than 13 hours (12.9) to fully top it up. Still, considering the range available, a single night of charging, or alternatively multiple nights during off-peak hours makes the I-Pace easy to live with. If access to a charger isn’t an issue, you might appreciate I-Pace performance more than its range. The British brand calls its newest creation an “all-electric performance SUV,” thanks in part to its balance of power. It uses an electric motor at each axle for standard all-wheel drive, the combination good for 394 horsepower and 512 pound-feet of torque, which means it can sprint from standstill to 100 km/h in 4.8 seconds. This said, eco-enthusiasts looking for I-Pace Concept performance might be a bit disappointed. The new numbers make it the quickest of all Jaguar’s “Pace” models nonetheless, the fastest new E-Pace R-Dynamic good for 6.4 seconds from zero to 100km/h, and the F-Pace S capable of the same feat in 5.5 seconds. In fact, you’ll need to step up to the 550 horsepower F-Type R Coupe in order to beat the new I-Pace off the line, although with 0.7 seconds to spare (or a full second in SVR trim) the iconic sports car doesn’t have to worry about losing its title just yet. Likewise for top-speed bragging rights, the I-Pace maxing out at 200 km/h (124 mph), which is 30 km/h (18.6 mph) down on the slowest E-Pace, let alone the 322 km/h (201 mph) terminal velocity of the F-Type SVR Coupe. Still, unless we’re talking Tesla Model X, 200 km/h is mighty fast for any EV. The Model X can manage 210 km/h (130 mph) in base 75D trim, by the way, but the I-Pace beats it from standstill to 100km/h by half a second. What’s more, the I-Pace is 0.2 seconds quicker than the mid-range Model X 100D, but keep in mind that few production cars can match the Model X P100D that can sprint from zero to 100km/h in just 3.2 seconds. Oh well, you can’t win ‘em all. Like the F-Type and most other models in the Jaguar lineup, the I-Pace utilizes the automaker’s expertise in lightweight engineering, its monocoque body shell comprised mostly of aluminum. This said it rides on a totally unique EV architecture, the aforementioned battery actually part of the floor’s structure, which allows for much greater flexibility in designing the cabin. First of all, the I-Pace starts out considerably longer than the E-Pace and slightly shorter than the F-Pace, slotting between Jaguar’s two conventionally powered SUVs in outward dimensions. By the numbers it’s 287 millimetres (11.3 inches) longer than the E-Pace and 49 mm (2.0 inches) shorter than the F-Pace, the latter of which is already a large compact SUV, but the I-Pace’ wheelbase is 309 mm (12.2 inches) and 116 mm (4.6 inches) longer respectively, for much greater front and rear legroom than either. What’s more, the I-Pace Concept’s roof is 84 mm (3.3 inches) lower than the E-Pace’s and nearly 86 mm (3.4 inches) down on the F-Pace, resulting in a sleeker, sportier profile. Added to this is much greater width for a sportier stance and greater side-to-side spaciousness, the I-Pace measuring 155 mm (6.1 inches) wider than the E-Pace and 69 mm (2.7 inches) more so than the F-Pace. The unique layout allows for a cab-forward design featuring a windshield that reaches far over the front wheels, as well as a shorter more steeply raked hood, plus shorter front and rear overhangs, with each wheel pushed out as far to its corner as possible, resulting in much greater interior volume and a strong, athletic stance. Having much of its weight down low, thus reducing its centre of gravity, plus endowed with the advantages of the lower roof height, increased wheelbase and the more substantive track that comes from the greater width mentioned a moment ago, handling should be another I-Pace strongpoint. The standard chassis appears to use unequal-length control arms and a stabilizer bar up front, plus an Integral Link setup with a stabilizer bar in the rear, while it all floats upon a standard Active Air Suspension featuring auto-leveling as well as the ability to reduce the I-Pace’ drag by automatically lowering a half inch at highway speeds, which should combine for an exceptionally good ride quality and handling compromise. Additionally, Jaguar says the I-Pace achieves ideal 50:50 weight distribution, so we should prepare ourselves for a particularly well-balanced EV. Jaguar’s driver-configurable continuously variable Adaptive Dynamics system is optional, which analyzes vertical wheel positions, vehicle acceleration, steering inputs, plus throttle and braking actuation before it automatically adjusts the suspension damping settings depending on your personal drive mode choice (Dynamic being the sportiest setting), while Adaptive Surface Response is also available, this system harvesting info from myriad sensors in order to calculate approximate adhesion levels on low-grip surfaces, such as ice, before you even apply steering input, and then after making your turn it minimizes understeer and oversteer levels by controlling throttle and braking inputs. Speaking of those binders, two levels of regenerative braking are part of the I-Pace’s standard package, with either its high or low settings providing different degrees of “engine braking” when lifting off the throttle. It’s in the nature of EVs to slow down when lifting off the accelerator pedal, but providing firmer automatic powertrain braking makes using the brake pedal less necessary, easing everyday driving and saving on brake maintenance plus otherwise expensive repair costs. As anyone familiar with modern-day Jaguars will appreciate, the I-Pace will combine contemporary design with rich traditional materials, not to mention state-of-the-art digital interfaces. The overall interior design is very similar to the I-Pace Concept, featuring available contrast stitched padded leather over most surfaces that aren’t finished in standard metals or hardwoods. To be specific, Jaguar will include its best Windsor leather as standard unless opting for a sport interior that features a premium textile in Dapple Grey. The four leather-covered cabin motifs will include Ebony (black), Light Oyster (light grey), Mars Red (crimson), and Siena Tan (caramel/saddle), while light beige and black headliners will be available in woven cloth or Suedecloth. Even the steering wheel rim will be available in Suedecloth or traditional leather, while decorative inlays, which highlight key areas on the instrument panel and doors, include Gloss Charcoal Ash veneer, a piano black lacquer Gloss Black, a patterned Monogram Aluminum, and Aluminum Weave Carbon Fibre. Like with other Jaguar models a head-up display system will be optional, but take note that a fully configurable 12.3-inch primary gauge cluster will be standard fare, as will two infotainment touchscreen displays that Jaguar dubs InControl Touch Pro Duo, the main top screen measuring 10 inches diagonally and a 5.5-inch secondary display, used primarily for the climate controls, sitting lower on the sloped centre console. All displays feature voice activation via Amazon’s Alexa, which should promote the use of hands-free interaction. Speaking of the latest tech, the I-Pace’ climate control system makes use of an artificial intelligence (AI) system that senses the number of occupants on board before adjusting the temperature, while the AI system is also capable of calculating the I-Pace’ remaining range based on climate control usage, weather conditions, topography, driving style, and traffic conditions. The HVAC controls sit atop a centre console that slants up toward the main display upon two flying buttress-style supports that house controls for the gear selector and driving mode switchgear, this at least partially paying homage to a design theme used by Jaguar in its F-Type sports car and new E-Pace utility, although the overall look of the new climate control interface, which incorporates large dials that appear as if they’re floating on top of a digital background, is more reminiscent of the new Range Rover Velar. Interestingly, a total of 12.2 litres (0.43 cubic feet) of storage space can be found under the centre armrest, its impressive size due to the absence of a transmission tunnel, whereas the rear seating area incorporates trays for tablets and laptops, not unlike what Jaguar offers in its top-line XJ. A large panoramic sunroof will shed light over both rows of occupants, while rear passengers will have the option of another two automatic climate control zones for a total of four. Rear passengers will also be able to enjoy Jaguar’s “Click and Go” front seatback attachment system, which will allow features such as display screens to be mounted quickly and easily, while plenty of cargo area add-ons will help enhance load space functionality. That cargo area measures 656 litres (23.1 cubic feet), incidentally, which makes it considerably larger than the E-Pace’s 577-litre (20.4 cubic-foot) rearmost compartment and similar to the F-Pace’s 685 kilos (1,510 lbs) of usable luggage space when the rear seats are upright. Jaguar hasn’t included a photo of the cargo area, but it’s likely finished nicely with high-grade carpets, chromed tie-down hooks, and split-folding rear seatbacks, hopefully in the most useful 40/20/40 configuration, or at least with a centre pass-through. Jaguar Canada is currently touting S, SE, and HSE trims on its website (yes, you can configure everything but pricing already), but so far there’s no sign of a First Edition. Jaguar normally offers special First Edition trim in a new model’s initial year, and has already announced it will do so in the U.S., but we’ll need to wait and see if a First Edition gets added to the Canadian offering. Of course, the I-Pace will also qualify for any provincial rebates, which are currently set to a maximum of $14,000 in Ontario, $8,000 in Quebec (which also offers a $4,000 rebate for purchasing a pre-owned EV), and $5,000 in BC, although West Coast buyers should be aware that new rules don’t allow for rebates for vehicles costing more than $77,000, and it’s likely the new I-Pace will exceed this number. While you can place an order immediately, we won’t know exact pricing until closer to launch, but take note the automaker’s U.S. division has already confirmed it’s targeting an MSRP below $100,000 USD ($128,940 CAD at the time of writing). Jaguar will probably undercut the larger 2018 Tesla Model X that starts at $111,950 in Canada, goes up to $135, 250 for the mid-range 100D, and tops off at $199,800 for the most powerful P100D, but we can’t expect something this stylish, luxurious, well made, high-tech, performance-oriented and prestigious to be fighting it out with the $45k Chevy Bolts of the world. Jaguar has promised that half of its vehicles will incorporate some sort of electrified drivetrain by 2025, so it’s quite possible plug-in models will eventually appear both above and below the new I-Pace.